This is my favorite interview ever and will always be. I got the privilege to talk about her story of becoming a doctor. She grew up with a single mother and her little sister. When her mother was injured on the job, she could no longer work and her family fell on hard financial times. There were periods of time when they were even homeless. Instead of stopping her, it motivated her even more to achieve her dream. 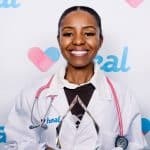 Listen as you learn about the adversity she overcame to become a doctor. Then hear how she became a doctor respected by her peers and beloved by her patients. She’s healing people and healing her community.